The first unusual feature of the Felsenkirche is its location where it´s built, in a hollow into the rocks, ca. 50 m above the riverbed and ca. 50 m below the ruins of a castle. It is not surprising that people have wondered over the centuries about why this site was chosen. This in turn has led to several versions of a legend, whose main idea is that two brothers from the House of the rulers of Oberstein were in love with the same woman, and one of the rivals did away with the other by pushing him out of a window of the old castle. Thereafter, the murderer was unable to regain his peace of mind until he had chiselled out hollowspace into the rocks with his own hands in the spot where his unfortunate victim had met his death, and, in this unusual location, built a house of God. Of course, this is only a legend, which is extremely dubious on scientific grounds alone: Carving a hollow approximately 25 m long, 17 m deep, with a height in the middle of 12 m, would make a cavity of 5,000 m3; and the stone, porphyrite, has a density of 2,400 kg/m3! Furthermore, the legend is not substantiated by the historical record. On the other hand, there was in fact once a murder of a relative in the family of the rulers of Oberstein: In 1328/29, Wirich of Daun was killed by a distant cousin Eberhard Bossel of (Ober-) Stein. But the victim did not die after falling from the rocks; rather, he was killed one night in his bed. The construction of the Felsenkirche seems to have nothing to do with this incident. It is probable that a medieval fortification originally stood in this natural hollow in the rocks. Not only the imposing stone walls (as high as the roof’s ledge and 1.90 m thick) — which are highly unusual for a church –, but also the three embrasure-like window openings catch the eye, and they give grounds for the assumption that a fortification was originally located there. This theory is strengthened by the fact that the distances between the embrasure windows, the sacristy windows, the columns in the nave, and the girded arches are uneven (see floor plan and cross section), which would have been highly unusual for a sacred building of this era. Should a fortification have stood there, it seems possible that it, too, had a kind of chapel which was integrated into the “new” church during a later rebuilding (1482/1484). 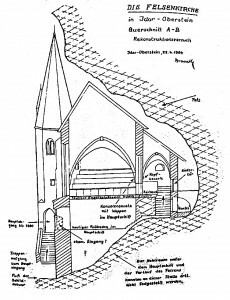 Cross-section through the Felsenkirche, clearly illustrating ‘the hole’ in the rocks.